Tory Island (Oileán Thoraígh in Irish) is a flattened, rocky outcrop 16km off the Donegal coast in the furthest northwest of Ireland. The island is approximately 5km long and 1km wide. It has a population of under 200, divided between two main settlements. There is no airport and even today the island is often cut off for days at a time during the winter storms. Tory is, not surprisingly, a tightly knit community which has evolved its own social customs and traditions over the years. It is a stronghold of the Ulster dialect of the Irish language and is also known for traditional music. Since the 1950s, it has been home to a small but thriving community of 'primitive' artists, and has its own art gallery. One of the artists is Patsai Dan Mac Ruaidhri (Patsy Dan Rodgers), who also holds the position of Rí Thoraí (King of Tory). As with the King on the Blasket Island in days gone by, this King has no formal power, but is chosen by consensus of the islanders to represent the community. Patsy Dan tries to greet all tourists as they arrive off the ferry from the mainland. In the modern era, Tory has faced the same problems as other offshore islands which were formerly largely self-sufficient. For political and cultural reasons, the Irish government has been keen to provide considerable support to the island's economy, both in terms of infrastructure and job creation, but attempts to start various new cash-generating enterprises have had mixed results, and because of its remoteness, its cool, wet and windy climate and the costs of access it is unlikely ever to be a popular tourist destination. However, Tory is a good potential cetacean watching location during the summer season, with dolphins and minke whales often seen in patches of calm weather, and orcas and bigger whales occasionally, and is also well frequented by basking sharks. There is one hotel on the island, the Tory Hotel; this also contains a public bar and the only restaurant. There is also some B&B accommodation and a Community Hall which hosts music and dancing. 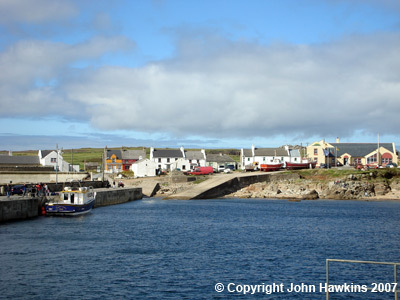 There are two ferry services to the island, one run by the Tory Island Ferry company and the other by the Tory Hotel. The cost in 2007 was €20. Duggie is often seen at the main island harbour where the passenger ferries to the mainland arrive and depart. However he also roams around the whole island, which has numerous inlets and smaller harbours, and one needs to be in the right place at the right time to connect with him, as if nothing interesting is going on in one place he is likely to keep moving. He also goes out to sea regularly, particularly if other dolphins are around.